London's population is different in structure, rates of change and churn compared with other parts of England. This has implications for the public services and funding it requires. 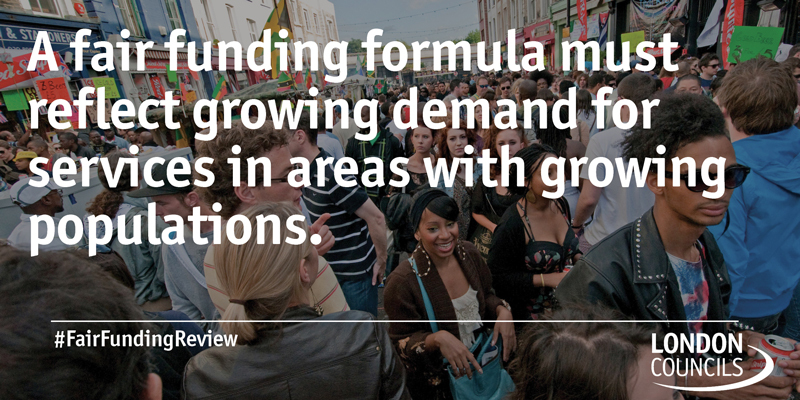 Since 2010 London’s population has grown by 12.7%: over double the growth rate of the rest of the country (5.4%). It is forecast to continue to grow at almost double the rate of the rest of the country and the fastest of any English region, over the next 21 years. The first chart below shows that over five years from the start of the new funding baselines (2020-2025) London’s population growth is forecast to grow notably by more than elsewhere across all of the major age cohorts. The second chart below, based on a 2014 baseline, shows that between 2018 and 2039, London’s population is expected to grow by 21% compared with just 11% for the rest of England. The second highest region is East of England at 16%. The third chart shows different growth rates across London boroughs over different time periods to 2020, 2030 and 2039 (when the ONS population projections end). London’s population shows a skew towards those in their early 20s to late 30s, which is not as prevalent in the rest of England. The rest of England, by contrast, has a higher proportion of its population at every age from 45 upwards. This data translates to a median age in England of 40, versus 34 in London. London’s younger population reflects a buoyant labour market and a comparatively high share of rented houses, more likely to be occupied by unmarried, young people without children. Dormitory towns and commuter networks mean older workers and families tend to move away from the city itself, further skewing the age distribution downwards. A high influx of working age population means that London has a younger population than England as a whole, which influences the kind of public services that are required in the capital. Different age related indicators within funding local government formulae are relevant for London compared with other parts of England. London has a higher rate of population “churn” than other areas due to its higher levels of outward and inward migration, and more transient population. This has implications for accurate counting of the population (at each Census) and for projecting population accurately. London’s high levels of migration mean it has many of the most undercounted local authorities in the country at the 2011 Census – which is the starting point for building population projections. On average response rates to the 2011 Census were 88% in inner London and 92% in outer London compared with 94%-96% for all other regions. London boroughs accounted for 16 of the 20 lowest response rates. It is positive that the Government has set out the intention that “the new funding formula must, as far as is practicable, anticipate future demand for services”. It is vital that any new formula builds in future growth through projections rather than static population figures. Any new needs assessment must be able to respond to such changes, as well as the consequent increase in demand for services, on a sufficiently frequent basis. However, if projections are built into the formula they must be robust and account for “hard to count” areas better. London’s higher rates of migration and population churn between boroughs mean that the costs associated with assessments, for example for children or adults with social care needs or in relation to housing, can be duplicated as clients move from borough to borough. We believe these additional costs should be considered as part of the Review.